Peroxisome proliferator-activated receptors (PPAR) are members of the nuclear hormone receptor superfamily of ligand-activated transcription factors. Three PPAR isoforms, designated PPARα, -β/δ, and -γ, have been identified and attracted enormous attention as a result of the key role that these receptors play in regulating adipogenesis, lipid metabolism, insulin sensitivity, inflammation, and BP. Growing evidence points to a causative relationship between PPAR activity and the metabolic syndrome, including insulin resistance, glucose intolerance or type 2 diabetes, obesity, dyslipidemia, hypertension, atherosclerosis, and albuminuria. Importantly, both PPAR-α activators, such as the fibric acid class of hypolipidemic drugs, and PPAR-γ agonists, including antidiabetic thiazolidinediones, have been proved to be effective for improving diverse aspects of the metabolic syndrome. All three PPAR isoforms seem to play important roles in the development of diabetic nephropathy in type 2 diabetes. Accumulating data suggesting that PPAR may serve as potential therapeutic targets for treating the metabolic syndrome and its related renal complications have begun to emerge. This article reviews the literature pertaining to the action, ligand selectivity, and physiologic role of PPAR. Particular emphasis is placed on their pathogenic roles in the metabolic syndrome and the therapeutic utility of PPAR modulators in the treatment of diabetic nephropathy. Peroxisome proliferator-activated receptors (PPAR) are nuclear hormone-activated receptors and transcription factors. To date, three different PPAR subtypes have been cloned and characterized: PPAR-α, PPAR-β/δ, and PPAR-γ (1–4⇓⇓⇓). The ligands for PPAR have been demonstrated to include structurally diverse compounds that vary from industrial chemicals and pharmaceutical drugs to endogenous fatty acids. These ligands can induce enormous molecular and cellular changes, including peroxisome proliferation, adipogenesis, β-oxidation enhancement, and cell-cycle regulation. After a decade of intense study, much has been learned regarding the molecular mechanisms by which PPAR activation results in its biologic consequences. PPAR have been shown to be critical factors in regulating diverse biologic processes, including lipid metabolism, adipogenesis, insulin sensitivity, immune response, and cell growth and differentiation (1–4⇓⇓⇓) and participate in the pathogenesis of a cluster of human diseases designated the metabolic syndrome, which includes insulin resistance, glucose intolerance, obesity, dyslipidemia, hypertension, atherosclerosis, and microalbuminuria (5–7⇓⇓). Importantly, the fibrate class of PPAR-α agonists including fenofibrate and clofibrate are clinically proven lipid-lowering drugs (8), whereas the thiazolidinedione (TZD) class of PPAR-γ ligands such as rosiglitazone (Avandia) and pioglitazone (Actos) have recently been introduced into clinical practice for treating hyperglycemia and insulin resistance in patients with type 2 diabetes (9). Increasing evidence also points to the therapeutic potential of PPAR-β/δ activators for improving insulin sensitivity and dyslipidemia (10). In addition, PPAR ligands have been considered as potential therapeutic agents for treatment of hypertension, atherosclerosis, and diabetic nephropathy (1,11⇓). This review examines the current knowledge relating to the action, ligand selectivity, and physiologic role of the PPAR family and then discusses the current understanding of the pathogenic roles of PPAR in the metabolic syndrome, with particular focus on the therapeutic potentials of PPAR modulators in the treatment of diabetic nephropathy. PPAR was originally identified by Isseman and Green (12) after screening the liver cDNA library with a cDNA sequence located in the highly conserved C domain of nuclear hormone receptors. The predicted encoded protein shares functional domains with other nuclear hormone receptors (Figure 1). These investigators further demonstrated that chemicals that act as peroxisome proliferators were potent ligands for this new nuclear receptor, hence its designation as PPAR-α. Since this initial identification, two additional PPAR isoforms with high sequence identity were identified and designated PPAR-β/δ and PPAR-γ. These three PPAR constitute the 1C group of the nuclear hormone receptor superfamily that consists of 48 nuclear receptor (NR) members. Similar to other nuclear receptors, PPARs including PPAR-α (NR 1C1), PPAR-β/δ (NR 1C2), and PPAR-γ (NR 1C3) contain four major functional domains: the N-terminal ligand-independent transactivation domain (A/B domain), the DNA binding domain (BDB or C domain), the co-factor docking domain (D domain), and the C-terminal E/F domain including ligand binding domain (LBD) and the ligand-dependent transactivation domain (AF2 domain; Figure 1) (13). Although PPARs exhibit high homology at the amino acid level and share very similar structure, they are differentially expressed in the body and display different ligand selectivity and biologic actions. Gene mapping studies demonstrated that these three PPAR isoforms are encoded by distinct genes mapping to human chromosome 22, 6, and 3, respectively (3). To date, three splice variants of the PPAR-γ isoform, designated PPAR-γ1, PPAR-γ2, and PPAR-γ3, have also been identified. These arise from differential splicing and alternative promoter usage of the PPAR-γ gene, sharing the six 3′ coding exons but differing only in the 5′ exons. PPAR-γ1 and -γ3 share identical protein sequence (PPAR-γ1 protein). In contrast, because the 5′ exon of the PPAR-γ2 variant contains an additional translation initial site, PPAR-γ2 gene gives rise to a protein with 30 additional amino acids in the N-terminal, which are not present in PPAR-γ1 (14,15⇓). Different promoter usage and protein sequence result in distinct gene expression pattern and biologic function of PPAR-γ1 and PPAR-γ3 (15). Figure 1. Schematic representation of the domain structure of human peroxisome proliferator-activated receptor-α (PPAR-α), -β/δ, and -γ. The number inside each domain corresponds to amino acid sequence identity of human PPAR-β/δ and -γ relative to PPAR-α. The numbers above the boxes indicate amino acid positions. DBD, DNA binding domain; LBD, ligand binding domain. The divergent amino acid sequence in the LBD of the three PPAR isoforms is thought to provide the molecular basis for ligand selectivity. On the basis of the elucidated crystal structure, a large ligand-binding pocket (1300 Å) exists in all three PPAR isoforms, allowing diverse and structurally distinct compounds access to the LBD (13) and enabling PPAR to sense a broad range of endogenous substances, including fatty acids and their metabolites (16). Thus far, a variety of endogenous and exogenous compounds, including industrial chemicals such as herbicides and plasticizers as well as synthetic pharmaceutical agents including hypolipidemic fibrates (e.g., fenofibrate, clofibrate) and antidiabetic TZD, have been shown to bind to and activate PPAR (17). Although many fatty acids are capable of activating all three PPAR isoforms (1,18⇓), some preference for specific fatty acids by each PPAR has been demonstrated. Fatty acids and their derivatives, including 8-S-hydroxyeicosatetraenoic acid, the arachidonic acid lipoxygenase metabolite LTB4, and arachidonate monooxygenase metabolite epoxyeicosatrienoic acids, have been shown to potently activate PPAR-α (1,17,19⇓⇓). Synthetic lipid-lowering drug fibrates are also potent ligands for activating PPAR-α. Endogenous arachidonic acid cyclooxygenase metabolite prostacyclin, the linoleic acid 15-lipoxygenase-1 product 13-S-hydroxyoctadecadienoic acid, and synthetic compounds including L-165041 and GW2433 have been found to be selective PPAR-β/δ ligands (20,21⇓). Naturally occurring PPAR-γ ligands including 15-deoxy-Δ (12,14⇓)-prostaglandin J2 (22) and oxidized metabolites of linoleic acid 9-hydroxy- and 13-hydroxy-octadecadienoic acids have been identified (23,24⇓). Furthermore, synthetic antidiabetic TZD including rosiglitazone (Avandia) and pioglitazone (ACTOS) are potent PPAR-γ selective agonists and have been very effective in improving glycemic control via insulin sensitization. The development and clinical use of PPAR ligands in the past decade have greatly advanced our understanding of the physiologic and pathophysiologic roles of PPAR and therapeutic implications of modulating these receptors. Upon binding their cognate ligands, the transcriptional activity of PPAR is altered. A conformational change in the PPAR/retinoid X receptor-α (RXR-α) dimer allows the heterodimer to bind to PPAR-response elements (PPRE) to activate gene transcription. PPRE generally consist of a direct repeat of hexameric core recognition elements spaced by 1 bp (DR1, 5′AGGTCANAGGTCA-3′) located in the promoter regions of target genes (Figure 2) (1). After activation of the PPAR/RXR heterodimer at the PPRE, the PPAR/RXR-α complex can recruit diverse nuclear receptor co-factors that modulate transcriptional activity of PPAR and RXR-α receptor heterodimer. These coactivators include cAMP response element-binding protein, PPAR-γ coactivators, cAMP response element-binding protein binding protein, and steroid receptor coactivator-1. Co-repressors such as nuclear receptor co-repressor and silencing mediator of retinoid acid and thyroid hormone receptor can modulate the transcriptional activity of PPAR by remodeling chromatin and establishing physical contacts with transcription initiation machinery (3,25⇓). Therefore, multiple mechanisms are involved in controlling the transcription of PPAR target genes in a given cell or tissue. The expression level of PPAR receptors, the chemical properties and local concentrations of PPAR-specific ligands, and the availability of these co-factors all contribute to the biologic effect of PPAR activation or inactivation. Figure 2. Molecular mechanism of action of PPAR-α, -β/δ, and -γ. The PPAR isoforms form heterodimers with retinoid X receptor-α (RXR-α) in the presence of their ligands. The resultant heterodimer binds to PPAR-response elements (PPRE) in the promoter regions of PPAR-driven genes through DNA-binding domains of PPAR and RXR-α. Coactivators and co-repressors are essential for modulating the transcription of PPAR target genes, which are involved in many biologic processes closely related to the metabolic syndrome, including insulin sensitization, adipogenesis, and lipid metabolism. PPAR-α, PPAR-β/δ, and PPAR-γ are differentially expressed among tissues (2,26–28⇓⇓⇓). In general, PPAR-α is highly expressed in tissues that possess high mitochondrial and β-oxidation activity, including liver, renal cortex, intestine mucosa, and heart. Lower expression of PPAR-α is also observed in several other tissues. PPAR-γ is highly enriched in adipose tissue, but lower expression levels have also been reported in urinary bladder, intestine, kidney, spleen, adrenal, heart, liver, lung, brain, and vasculature. Unlike PPAR-α and PPAR-γ, PPAR-β/δ seems to be ubiquitously expressed at low levels in almost every tissue examined. In the kidney, PPAR-α is highly abundant in the proximal tubules and medullary thick ascending limbs with much lower levels in glomerular mesangial cells (26,29⇓), whereas PPAR-γ is primarily expressed in the distal medullary collecting ducts and to a lesser extent in glomeruli and renal microvasculature (26,30⇓). In the kidney, PPAR-β/δ seems to be diffusely expressed in renal cortex and medulla, including medullary interstitial and stromal cells (26). The differential tissue distribution and intrarenal localization of these three PPAR isoforms is consistent with the possibility that they play distinct roles in these tissues, including the kidney. Because the target genes of PPAR-α, -β/δ, and -γ in these tissues are mainly involved in adipogenesis, lipid metabolism, insulin sensitivity, glucose homeostasis, and cell growth and differentiation, PPARs are likely candidate targets for modulating the metabolic syndrome. The term metabolic syndrome (also referred to as syndrome X) was first introduced by Reaven in 1988 to describe the concurrent existence of atherogenic risk factors and underlying insulin resistance (7,31⇓). The definition was then refined by the World Health Organization in 1997 to refer to a specific clustering of disorders associated with increased risk for cardiovascular disease and related mortality (32). According to the current unifying definition, key elements of the metabolic syndrome include insulin resistance (hyperinsulinemia), abnormal glucose metabolism (impaired glucose intolerance or type 2 diabetes), hypertension, atherogenic dyslipidemia (low HDL cholesterol or high triglycerides), central obesity, hyperuricemia, microalbuminuria, and hypercoagulation state (increased fibrinogen and plasminogen activator inhibitor-1 (Figure 3). For clinical diagnosis of the metabolic syndrome, there are currently two similar diagnostic criteria. The World Health Organization definition requires at least one of three major features, including type 2 diabetes, impaired glucose tolerance, and insulin resistance, plus at least two of the minor features, including hypertension, obesity, hypertriglyceridemia, and microalbuminuria (32) (Table 1). The National Cholesterol Education Program Adult Treatment Panel III Guidelines require three of five clinical criteria, including abdominal adiposity, hypertriglyceridemia, low HDL, hypertension, and fasting hyperglycemia, to make a diagnosis (33). Using either diagnostic criteria, the prevalence of the metabolic syndrome currently exceeds 20% of individuals at least 20 yr of age and 40% of the population over the age of 40 yr, affecting ∼47 million Americans (5,34⇓). A substantial proportion of the U.S. population is at risk for the major adverse health consequence of the metabolic syndrome: cardiovascular disease. There is a threefold increase in risk for coronary artery disease and stroke in patients with the syndrome (35). Therapy directed at individual features of the metabolic syndrome therefore should have a dramatic impact on lowering morbidity and mortality from cardiovascular disease. Figure 3. Key features of the metabolic syndrome or the insulin-resistant syndrome (see text for details). Note that insulin resistance is believed to be a central element in the development of the metabolic syndrome. 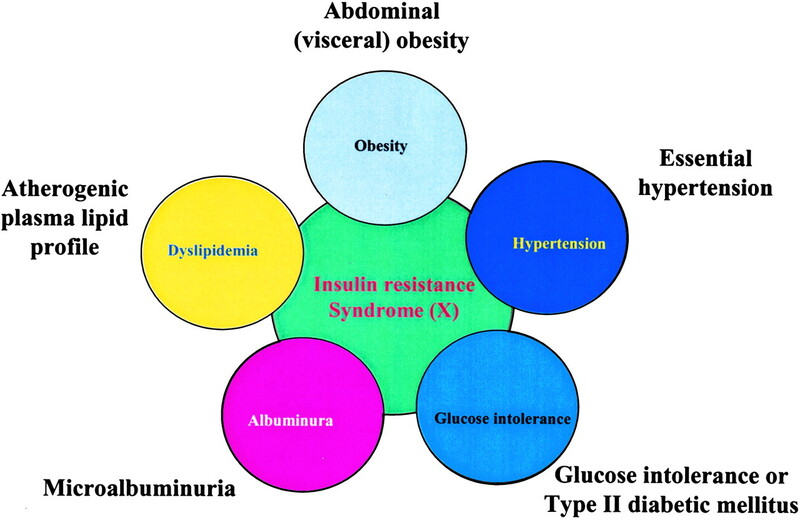 Although multiple factors contribute to the metabolic syndrome, insulin resistance seems to be a central pathophysiologic process behind the metabolic syndrome (33). Insulin resistance is a well-established and major risk factor for development of type 2 diabetes. In fact, the severity of insulin resistance is one of the strongest predictors of type 2 diabetes (36). Up to 75% of individuals with type 2 diabetes also meet the diagnostic criteria for the metabolic syndrome, with insulin resistance, obesity, hypertension, dyslipidemia, and microalbuminuria (37). It has also become clear that excessive intra-abdominal obesity is associated with insulin resistance, hyperinsulinemia, glucose intolerance, and atherogenic lipid profile (5,38⇓), and an epidemic of obesity derived presumably from physical inactivity and excessive food intake contributes to the worldwide increased incidence of type 2 diabetes (39). Hypertension is another common feature of the metabolic syndrome, occurring with a prevalence of 50% in insulin-resistant patients. It has been proposed that insulin resistance is associated with impaired insulin-mediated vasodilation, contributing to hypertension (40). Finally, atherogenic dyslipidemia is a common finding in patients with type 2 diabetes, particularly in nondiabetic insulin-resistant individuals (41). Although the causality behind the association between insulin resistance and dyslipidemia remains largely controversial, lipid-lowering pharmacologic agents have been shown to produce marked reductions in cardiovascular disease events in patients with diabetes (42,43⇓). Accumulating evidence demonstrates that PPAR-α is an important modulator of the metabolic syndrome and may be a therapeutic target for treating some of its features, especially cardiovascular complications. PPAR-α has been identified as a key regulator of the genes involved in fatty acid oxidation, which occurs in mitochondria, peroxisomes, and microsomes in the liver (44). Transcription and protein levels of critical enzymes in β-oxidation and ω-oxidation pathways are direct targets of PPAR-α, including acyl CoA oxidase, carnitine palmitoyl transferase I, mitochondrial hydroxymethylglutaryl-CoA synthase, and cytochrome P450 4A enzymes (CYP4A) (1). By increasing the expression of these genes, PPAR-α ligands significantly activate hepatic fatty acid oxidation, whereas genetic inactivation of the PPAR-α gene results in massive accumulation of lipids in the liver, severe hypoketonemia, hypoglycemia, hypothermia, and elevated plasma free fatty acid levels (45). These data clearly indicate that PPAR-α is a key factor in governing metabolic adaptation to increased fatty acids. PPAR-α also plays a critical role in lipid metabolism. Its known target genes are involved in almost all aspects of lipid metabolism, including uptake, binding, and oxidation of fatty acids; lipoprotein assembly; and lipid transport (1,46⇓). Synthetic PPAR-α ligands, such as gemfibrozil, fenofibrate, and clofibrate, have been used in clinical practice as hypolipidemic agents for >3 decades. Fibrates increase the synthesis of HDL through several PPAR target genes, including apolipoprotein A-I, apolipoprotein A-II, lipoprotein lipase, adenosine triphosphate-binding cassette transporter-1, and scavenger receptor class B type I and CLA-1, thereby enhancing the HDL cholesterol protective effect and leading to major clinical benefits. PPAR-α activation also increases fatty acid uptake, decreases triglyceride level, and promotes triglyceride-VLDL lipolysis (46–48⇓⇓). Taken together, it seems that PPAR-α may be a lipid sensor and can exert beneficial metabolic effects on lipid metabolism. Altered PPAR-α has also been implicated in the pathogenesis of obesity and insulin resistance (49). Activation of PPAR-α reduces weight gain in rodents, and inactivation of PPAR-α results in a late onset of obese phenotype (50,51⇓). Treatment of PPAR-α null mice with a high-fat diet leads to a more dramatic increase in body weight (52), further suggesting that PPAR-α may be involved in the genesis of obesity. Evidence has recently emerged suggesting that PPAR-α is an important regulator of insulin sensitivity. Treatment with PPAR-α activators dramatically improved insulin resistance and glycemic control in type 2 diabetic db/db mice and OLETF rats (53–55⇓⇓). Similarly, the PPAR-α agonist bezafibrate markedly improved glucose intolerance and insulin resistance in a lipoatrophic diabetic patient (56). More important, Koh et al. (54) recently reported that the PPAR-α agonist fenofibrate prevents the development of diabetes in insulin-resistant obese OLETF rats. Although the downstream mechanisms underlying these observations are not clear, they are consistent with the idea that PPAR-α plays a critical role in regulating insulin sensitivity in vivo and that its activation may lead to the delay of onset of type 2 diabetes. PPAR-α has also been implicated in BP regulation and vascular inflammation. PPAR-α is expressed in both vascular endothelial cells and smooth muscle cells (57,58⇓), where it inhibits vascular inflammation, oxidative stress, and cell growth and migration through blocking NF-κB, TGF-β/Smad, and mitogen-activated protein kinase (MAPK) pathways (59,60⇓). In vivo studies further demonstrate that PPAR-α agonists can significantly reduce angiotensin II (Ang II)–induced hypertension in rats, possibly by improving endothelial dysfunction (61). Alternatively, effects of PPAR-α activation on renal salt transport seem likely. PPAR-α has been found to co-localize with arachidonate CYP450 4A enzymes in the renal proximal tubule, and P450 4A monooxygenases are known PPAR-α target genes. Knockout cyp4A14 mice exhibit androgen-dependent hypertension (62), whereas 4A10−/− mice develop salt-sensitive hypertension (Dr. J. Capdevila, personal communication). Thus, regulation of CYP4A by PPAR-α ligands could play an important role in sodium homeostasis and BP regulation (63–65⇓⇓). Finally, fibrate PPAR-α activators have been reported to potently reduce atherosclerosis both in apoE−/− mice and in human ApoAI transgenic apoE−/− mice (66). More important, fibrate treatment of patients who exhibit more than three features characteristic of the metabolic syndrome (diabetes, glucose intolerance or high fasting insulin, hypertension, obesity, and high triglycerides or low HDL cholesterol) was associated with a significant 35% risk reduction in the rate of coronary artery disease death, nonfatal myocardial infarction, or definite stroke (43,67,68⇓⇓). These data support the concept that fibrate PPAR-α agonists may be particularly effective agents for the cardiovascular complications of the metabolic syndrome. In summary, PPAR-α participates in many biologic events, including lipid metabolism, energy homeostasis, inflammation, BP regulation, and insulin sensitization. It therefore may be an important factor in the pathogenesis of the metabolic syndrome. Activation of PPAR-α favors fatty acid oxidation and improves insulin resistance. Modulators of PPAR-α activity could provide useful therapeutic agents for treating some features of the metabolic syndrome and preventing the onset of type 2 diabetes. Although the existence of PPAR-β/δ has been recognized for several years, its biologic role and medical relevance have just recently come under investigation. It has been found that PPAR-β/δ action encompasses a panoply of physiologic and pathophysiologic activities, including effects on reproduction, mast cell immunity, bone formation, skin and brain development, wound healing, and tumorigenesis (1). Similar to the other two isoforms of the PPAR family, emerging evidence suggests that PPAR-β/δ may be a pivotal factor in metabolic control. Early studies pointing to a possible role for PPAR-β/δ in adipogenesis showed overexpression of PPAR-β/δ in NIH 3T3 fibroblast–induced PPAR-γ2 expression. In 3T3-L1 preadipocytes, which express endogenous PPAR-γ, a PPAR-β/δ selective agonist L-165041 markedly promoted mitotic clonal expansion with only minor terminal differentiation (69). Therefore, the activation of PPAR-β/δ may be involved in adipogenesis via promoting proliferation of adipocyte precursor cells. A role for PPAR-β/δ in the pathogenesis of obesity has also been suggested on the basis of a study in which PPAR-β/δ null mice exhibited reduced fat mass (70). Nevertheless, no reduction of fat mass is observed in adipose-specific ablation of PPAR-β/δ mice (71). More recently, Evans and colleagues (72) further demonstrated that adipocyte-specific PPAR-β/δ transgenic mice exhibit a lean phenotype with increased fatty acid oxidation and energy uncoupling in fat tissue. In addition, these mice are resistant to high-fat diet–induced and leptin receptor mutation–induced obesity. It seems that PPAR-β/δ may serve as a regulator of fat catabolism and is a potential therapeutic target for treating obesity and its associated disorders. Other studies using PPAR-β/δ selective agonists point to key roles for PPAR-β/δ in lipid metabolism. Using obese diabetic db/db mice as a model, Leibowitz et al. (10) examined the effect of a PPAR-β/δ–specific agonist L-165041 on plasma lipid profile. L-165041 treatment significantly increases HDL cholesterol levels, possibly associated with a decreased lipoprotein lipase activity in the white adipose tissue. Confirmatory results were recently obtained with a more potent and selective PPAR-β/δ agonist, GW501516 (Ki = 1.1 ± 0.1 nM) in insulin-resistant middle-aged obese rhesus monkeys (73). The results showed that GW501516 causes a dramatic dose-dependent increase in serum HDL cholesterol and a reduction in LDL and triglycerides, suggesting that activation of PPAR-β/δ is associated with a less atherogenic lipid profile. 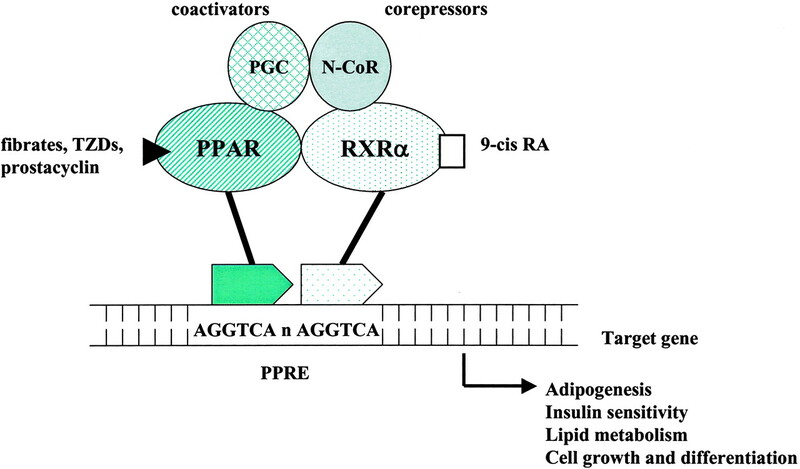 PPAR-β/δ receptor may also be critically involved in insulin resistance. In a primate model of the metabolic syndrome, the PPAR-β/δ selective agonist GW501516 dose-dependently lowered plasma insulin levels, without adverse effects on glycemic control (73). Similarly, in ob/ob mice, a model of the metabolic syndrome, a PPAR-β/δ–specific agonist markedly improved glucose tolerance and insulin resistance (74). Although the underlying mechanism is unclear, activation of PPAR-β/δ in skeletal muscle, which has a significant role in insulin sensitivity, has been proposed to account for the beneficial metabolic effects of PPAR-β/δ agonists on lipid profile and insulin resistance, possibly as a result of increased fatty acid catabolism, cholesterol efflux, energy expenditure (74,75⇓), and oxidative capability (76) in the muscle. Finally, PPAR-β/δ has recently been proposed as a potential target for modulating foam cell and macrophage activation in atherosclerosis. In vitro studies suggested that PPAR-β/δ activation in cultured macrophage results in increased expression of the reverse cholesterol transporter ATP-binding cassette A1 and enhances efflux of cholesterol (73). PPAR-β/δ also participates in cellular VLDL sensing and mediates VLDL-triglyceride–driven transcription events in macrophage (77). VLDL-triglyceride treatment results in triglyceride accumulation and the induction of adipocyte phenotype, which can be blocked by disruption of the PPAR-β/δ gene. These new observations suggest that agonists for PPAR-β/δ may be effective agents to reverse cholesterol deposition in foam cells in atherotic lesions and therefore decrease cardiovascular disease associated with the metabolic syndrome. It is interesting that a very recent study showed that PPARβ/δ−/− bone marrow transplantation leads to a drastic reduction in atherotic lesions compared with PPAR-β/δ+/+ bone marrow transplantation in γ-irradiated LDLR−/− mice that were fed a high-fat diet, likely as a result of disassociation of PPAR-β/δ from anti-inflammatory transcriptional repressors including BCL-6 in macrophages (78). Thus, these findings suggest that both PPAR-β/δ modulators (agonists or antagonists) may have therapeutic potential in attenuating inflammation and slowing the progression of atherosclerosis. Taken together, PPAR-β/δ is a critical player in the pathogenesis of the metabolic syndrome, and its ligands may provide useful agents for treating dyslipidemia, obesity, insulin resistance, and atherosclerosis. Studies conducted during past decade have led to an explosion in our understanding of the role of PPAR-γ in the metabolic syndrome. PPAR-γ has been implicated in almost all aspects of the cluster of metabolic disorders, including obesity, insulin resistance, dyslipidemia, inflammation, and hypertension. Much of this evidence derives from the increasing clinical use of synthetic TZD ligands of PPAR-γ as a new class of insulin-sensitizing agents in treating type 2 diabetes. PPAR-γ may also provide an attractive therapeutic target in the treatment of obesity, hypertension, and atherosclerosis. The first exciting discovery about PPAR-γ was the demonstration of the key role that it plays in adipogenesis, i.e., fat cell differentiation. PPAR-γ is especially abundant in adipose tissues and particularly important during adipocyte differentiation (79). Many genes involved in fatty acid transport and metabolism are transcriptionally regulated by PPAR-γ, including adipocyte fatty acid binding protein, phosphoenolpyruvate carboxykinase, acyl-CoA synthase, fatty acid transport protein (FATP), fatty acid translocase (CD36), and lipoprotein lipase (2). In preadipocytes, TZD PPAR-γ ligands alone are sufficient to induce terminal differentiation, and forced ectopic expression of PPAR-γ in fibroblasts drives adipogenesis in the presence of PPAR-γ agonists (80). In contrast, inhibition of endogenous PPAR-γ activity by a dominant-negative PPAR-γ mutant completely blocked TZD-induced preadipocyte differentiation (81). In vivo studies also support a role for PPAR-γ in fat formation. Dysfunction of PPAR-γ has also been found to have significant effects on body fat mass. PPAR-γ null mice completely lack adipose tissues, consistent with experiments showing that PPAR-γ null embryonic stem cells fail to contribute to development of fat tissues (82). Similarly, a gain of function of human PPAR-γ mutant (Pro115Gln) causes severe obesity in patients (83), whereas patients with the common Pro12Ala PPAR-γ variant that displays lower activity than wild-type are associated with lower body mass and decreased risk for type 2 diabetes (84). Collectively, these data demonstrate that PPAR-γ is a key transcription factor in adipogenesis, and overactive PPAR-γ may contribute to the pathogenesis of obesity. Although some studies indicate that TZD drugs induce a redistribution of fat away from the central compartment to the periphery (85), caution should be taken when TZD drugs are administered to patients with type 2 diabetes. The safety of these drugs for long-term usage in larger patient populations remains to be established in future clinical studies. As discussed above, insulin resistance is a central feature of the metabolic syndrome (86). It is generally believed that the development of insulin resistance is an early event in the development and progression of type 2 diabetes. Importantly, loss-of-function mutation of PPAR-γ results in severe insulin resistance in humans (87). That synthetic TZD PPAR-γ agonists, including troglitazone (no longer available in clinical practice), rosiglitazone, and pioglitazone, effectively improve insulin sensitivity and lower blood glucose level in patients with type 2 diabetes is consistent with the possibility that PPAR-γ activation improves insulin resistance (88). In support of this, ligands of RXR-α, the obligate partner of PPAR-γ, also lower glucose in a manner that is additive to PPAR-γ agonists (89,90⇓). In addition, TZD PPAR-γ agonists have recently been found to prevent the onset of type 2 diabetes in insulin-resistant OLETF rats (54), perhaps by improving peripheral insulin action and exerting beneficial effects on pancreatic β-cells. These data support a model whereby increased PPAR-γ activity enhances insulin sensitivity. However, recent studies using both PPAR-γ antagonists and heterozygous PPAR-γ–deficient mice (PPARγ+/−) paint a more complex picture. Unexpectedly, PPARγ+/− mice presumed to have reduced PPAR-γ activity exhibit enhanced rather than reduced insulin sensitivity as well as reduced weight gain after a high-fat diet (91,92⇓). In a separate study using selective PPAR-γ antagonists, both PPAR-γ and RXR-α inhibitors ameliorated high-fat diet–induced obesity and insulin resistance in mice (93). Taken together, these findings suggest insulin sensitivity depends on an optimal range of endogenous PPAR-γ activity, although the underlying mechanisms remain largely uncharacterized. One possible mechanism by which PPAR-γ increases insulin sensitivity relates to adipocyte-derived signaling molecules or adipocytokines. Several groups have reported that altered levels of adipocytokines, including TNF-α, IL-6, leptin, resistin, and adiponectin, may contribute to the favorable effects of TZD (94–100⇓⇓⇓⇓⇓⇓). For instance, neutralizing antibodies to resistin and recombinant adiponectin dramatically improve insulin sensitivity in db/db type 2 diabetic mice or high-fat diet–fed mice (95,97⇓). Increased TNF-α, leptin, and resistin levels and decreased adiponectin expression in adipose tissues are associated with the development of insulin resistance (99,101⇓). Conversely, reduced TNF-α, leptin, and resistin production and an increase in adiponectin synthesis were evident after TZD treatment (99). Increased glucose uptake in adipose tissue, reduction in free fatty acid burden on liver and muscle, a decrease in free fatty acids release from adipocyte, and an increase in energy expenditure also have been suggested to contribute the beneficial effect of TZD PPAR-γ agonists on insulin resistance (102). Atherogenic dyslipidemia including elevated plasma triglycerides and reduced HDL cholesterol is a common component of the metabolic syndrome. Because PPAR-γ has been proved to be pivotal in controlling adipogenesis and fatty acid metabolism and loss-of-function mutation of PPAR-γ causes elevated triglycerides and low HDL levels in humans (87,103⇓), TZD PPAR-γ activators are expected to improve dyslipidemia in insulin-resistant individuals. In fact, significant and sustained increases in HDL cholesterol and decreased free fatty acid levels and total cholesterol to HDL cholesterol ratio have been observed in people who were treated with troglitazone and pioglitazone (104–106⇓⇓). Although TZD causes a slight increase in LDL cholesterol, they produce an increase in the level of relative large and less atherogenic buoyant LDL particles and a decrease in the number of small but more atherogenic dense LDL particles (107,108⇓). Furthermore, both TZD rosiglitazone and pioglitazone have been shown to be effective and well tolerated when used in combination with statins (107,109⇓), likely adding beneficial effects on dyslipidemia in patients with the metabolic syndrome. PPAR-γ activity has also been suggested to play an important role in BP regulation. TZDs have been found to significantly lower BP in both diabetic animals and humans (110–114⇓⇓⇓⇓). It is generally thought that the antihypertensive effect of TZD is a result of improved insulin sensitivity, because enhanced insulin sensitivity has been found to be associated with lower BP in both diabetic animals (115–118⇓⇓⇓) and patients (119). Evidence has also emerged suggesting that direct vascular actions of PPAR-γ may also play a role. PPAR-γ has been detected in both endothelium and vascular smooth muscle cells (120–124⇓⇓⇓⇓). Studies on 1K/1C and Ang II–induced hypertensive rats and human renin/angiotensinogen transgenic mice, hypertensive models not associated with insulin resistance, show that TZD treatment significantly lowers BP (125–127⇓⇓), arguing for direct vascular action of TZD. Although the underlying mechanisms remain unclear, inhibition of vasoconstrictors such as endothelin-1 and stimulation of vasodilators including prostacyclin and nitric oxide have been proposed to play a role (128–132⇓⇓⇓⇓). PPAR-γ may also directly affect vascular smooth muscle cell tone through downregulation of Ang II receptor 1, thereby decreasing vascular contractility (133). It is also worth mentioning that TZD treatment frequently results in sodium and water retention, possibly via activating PPAR-γ in renal microvasculature and collecting duct (26,30,134,135⇓⇓⇓). The long-term consequences of TZD-associated fluid retention on BP remain to be determined. Taken together, PPAR-γ activity regulates BP through multiple mechanisms, and its ligands might provide adjunct antihypertensive agents in the metabolic syndrome. Caution must be applied when using these agents in patients who are prone to fluid retention and/or congestive heart failure. Finally, PPAR-γ has been implicated in almost all of the pathologic processes that contribute atherosclerosis, including foam cell formation, inflammation, and cell proliferation (11). PPAR-γ promotes adipogenesis raised the worrisome possibility that PPAR-γ might be proatherogenic in patients who receive TZD treatment. However, recent data from animal studies and clinical trials indicate that TZD PPAR-γ ligands actually consistently decrease atherosclerotic lesion formation, independent of changes in circulating lipid levels, BP, and glycemic control (136–138⇓⇓). The underlying beneficial mechanisms may be via increased cholesterol efflux from macrophages by enhanced expression of the ABAC1 gene, as a consequence of activating the PPAR-γ–LXR–ABAC1 pathway (139,140⇓). Thus, although PPAR-γ is involved in both influx (oxidized LDL-CD36 pathway) and efflux (LXR-ABAC1 pathway) of cholesterol in macrophages, the net effect seems to be removal of cholesterol from macrophages, thereby blocking foam cell formation. It has been long known that PPAR-γ has anti-inflammatory effects on monocytes. PPAR-γ activation can reduce cytokine (TNF-α, IL-1, and IL-6) production (141), probably by inhibiting the activity of proinflammatory transcription factors such as NF-κB, AP-1, and STAT (142). PPAR-γ also reduces vascular smooth muscle cell proliferation, increases monocyte apoptosis, and suppresses metalloproteinase-9 expression in atherotic plaques (121,122,143,144⇓⇓⇓). In addition, PPAR-γ agonists may indirectly suppress systemic production of a proinflammatory milieu mainly by inhibiting TNF-α, plasminogen activator inhibitor-1, and IL-6 expression in adipose tissue (145,146⇓). Elevated levels of HDL cholesterol and reduced triglyceride levels may also contribute to the beneficial effect of PPAR-γ agonists in atherosclerosis (147). On the basis of these data, it seems likely that TZD PPAR-γ agonists will have beneficial effects on atherosclerosis and provide a promising therapy for the metabolic syndrome and its cardiovascular complications. Taken together, all three PPAR isoforms play critical regulatory roles in a variety of biologic processes closely related to the metabolic syndrome, including adipogenesis, lipid metabolism, energy metabolism, insulin sensitivity, inflammation, and cell growth and differentiation. Modulators including both agonists and antagonists for the three PPAR isoforms may serve as potential therapeutic drugs in the treatment of the metabolic syndrome and delay the onset of type 2 diabetes as well. With worldwide epidemic of the metabolic syndrome, renal complications related to each feature of this cluster of metabolic abnormalities have become a serious health concern. The primary therapy for treating the metabolic syndrome remains a multifactorial process that includes the physiologic approaches of lifestyle change, diet control, and weight loss and pharmacologic interventions including aspirin, anti-ischemic agents, antihypertensive drugs, lipid-lowering therapy, and insulin sensitizers (5,6⇓). All three PPAR isoforms have been identified as therapeutic targets in the treatment of the metabolic syndrome (see above). The fibrate class of PPAR-α agonists including clofibrate and fenofibrate and the TZD class of PPAR-γ activators including rosiglitazone and pioglitazone have been used effectively in clinical practice in treating insulin resistance, atherogenic dyslipidemia, obesity, hypertension, and atherosclerosis. Recently, increasing evidence has also suggested a therapeutic potential for PPAR activators in renal complications of the metabolic syndrome, especially diabetic nephropathy (1,17⇓). The potential therapeutic role of PPAR-α, PPAR-β/δ, and PPAR-γ in diabetic nephropathy is discussed below. Although it has been well established that PPAR-α is abundant in the kidney, the role of PPAR-α in renal physiology and diabetic nephropathy is just emerging. Given the high level in renal proximal tubules (26,148,149⇓⇓), PPAR-α has been implicated in the metabolic control of the kidney to maintain a sustained balance of energy production and expenditure (150). Activation of PPAR-α by clofibrate significantly induced expression of β-oxidation enzymes in renal cortex, including long-chain acyl-CoA dehydrogenase, medium-chain acyl-CoA dehydrogenase, and acyl-CoA oxidase (151), suggesting that renal PPAR-α might play a major role in triggering the fatty acid utilization and adaptive response to dietary lipids by the kidney. This idea is further supported by a recent study in which fasting (24 h)-induced upregulation of pyruvate dehydrogenase kinases was blunted in PPAR-α–deficient mice, indicating that PPAR-α is important for renal adaptation to starvation (152). Although PPAR-α induction in response to fasting and hyperlipidemia seems beneficial, the effect of PPAR-α in diabetic nephropathy remains uncertain. Cardiac overexpression of PPAR-α results in increased fatty acid oxidation, elevated lipid droplets, and worsened cardiomyopathy, suggesting that PPAR-α activation may be harmful (153). These findings raise a potential therapeutic concern for patients who have diabetic nephropathy and receive oral fibrate treatment, because a marked increase in PPAR-α gene expression has been evident in diabetic kidney (154). However, clinical evidence suggests a beneficial effect of fibrate treatment on type 2 diabetes and diabetic nephropathy (155,156⇓). In normotensive patients with non–insulin-dependent diabetes, effective treatment of dyslipidemia by a PPAR-α activator gemfibrozil for 12 mo was associated with significant stabilization of urine albumin excretion (156). In line with these clinical observations, recent studies showed that fibrate treatment improves insulin resistance and glycemic control (54,157⇓) and reduces diabetic renal complications (55) in genetic rodent models of type 2 diabetes. In db/db type 2 diabetic mice, treatment with fenofibrate markedly lowers urinary albumin excretion and improves glomerular mesangial expansion (55). To date, multiple mechanisms have been implicated in the favorable renal effect of PPAR-α activators. In addition to the systemic effect, direct renal action may play a role. One possible mechanism relates to the effect of PPAR-α activators on the mesangial matrix production induced by TGF-β signaling pathway. Because glomerular mesangial cells express PPAR-α (158) and clofibrate directly inhibits oxidant stress–induced TGF-β1 expression in these cells (159), it has been proposed that PPAR-α activators may exert direct effects on mesangial cells where PPAR-α activation blocks TGF-β signaling pathway, thereby attenuating glomerular matrix production. In agreement with this, a recent study demonstrated that fenofibrate downregulates TGF-β1 and TGF-β signaling receptor II expression and decreases collagen IV deposition in the diabetic glomeruli (55). In addition, there is evidence that starved PPAR-α null mice develop increased albuminuria and exhibit albumin accumulation in the proximal tubules (160). Thus, PPAR-α activity may facilitate albumin reabsorption and degradation in this nephron segment (160). This mechanism may contribute to the beneficial effect of PPAR-α agonists on albuminuria in type 2 diabetes. Taken together, PPAR-α is important in the pathogenesis of diabetic nephropathy and may be a reasonable therapeutic target for treating diabetic renal complications. Although PPAR-β/δ seems to be abundant in the kidney (26,161⇓) and ubiquitously expressed along the nephron (26), the role of this PPAR isotype in the kidney remains poorly understood. Recently, a study by Escher et al. (161) raised a possibility that PPAR-β/δ may contribute to renal metabolic adaptation to fasting and refeeding. In their study, after an overnight fast, PPAR-β/δ mRNA in the kidney was dramatically downregulated and was rapidly restored to control levels upon refeeding. Moreover, this tight nutritional regulation is independent of the presence of PPAR-α, because similar regulation of PPAR-β/δ is observed in PPAR-α knockout mice. In cultured renal medullary interstitial cells, abundant and active PPAR-β/δ has been observed. Overexpression of PPAR-β/δ can protect cultured medullary interstitial cells from hypertonicity-induced cell death, suggesting that PPAR-β/δ is an important survival factor for medullary interstitial cells in the hypertonic condition in renal medulla (162). Given the role that PPAR-β/δ plays in the metabolic syndrome and its renal expression (see above), it is anticipated that this receptor may also be involved in the pathogenesis of diabetic nephropathy. Additional studies using PPAR-β/δ–specific agonists or PPAR-β/δ gene targeting mice should help to clarify the involvement of PPAR-β/δ in this setting. In contrast to PPAR-α and PPAR-β/δ, PPAR-γ has a well-established therapeutic role for treating type 2 diabetes (9,163⇓). Favorable renal effects have also been seen, including both indirect systemic effect and direct renal effects. TZD therapy has been associated with marked reduction in microalbuminuria in patients with type 2 diabetes (114,164,165⇓⇓). When compared with other oral hypoglycemic agents, including metformin, glyburide, and glibenclamide, all TZD PPAR-γ agonists (troglitazone, rosiglitazone, and pioglitazone) exhibit similar glycemic control but seem to provide superior renal protection in humans with type 2 diabetes (166–168⇓⇓). In keeping with the observations that PPAR-γ is present in glomerular mesangial cells (29,169⇓), these data are consistent with direct renal action of TZD in diabetic kidney. Moreover, TZD PPAR-γ agonists have been shown to improve diabetic nephropathy in animal models of both type 1 and type 2 diabetes, further supporting the idea that systemic effect and local action both account for the beneficial renal effect of TZD in type 2 diabetes (167,170–174⇓⇓⇓⇓⇓). For example, troglitazone therapy significantly decreased urinary albumin excretion, reduced glomerular hyperfiltration, ameliorated mesangial expansion, and inhibited renal matrix protein and TGF-β expression in streptozotocin-induced type 1 and Zucker type 2 diabetic rats (172,175⇓). In a separate study, Baylis et al. (173) demonstrated that rosiglitazone treatment reduced albuminuria, improved GFR, and normalized glomerulosclerosis and tubulointerstitial fibrosis in obese type 2 diabetic rats. Finally, the possibility that direct renal effects mediate favorable action of TZD in diabetic nephropathy is strengthened by its presence in renal glomeruli and cultured mesangial cells (29,30,169,176,177⇓⇓⇓⇓) and by the fact that troglitazone is effective in slowing the progression of glomerular fibrosis in a non–insulin-resistant 5/6 nephrectomized rat model (178). Treatment of cultured mesangial cells with PPAR-γ ligands inhibits cell growth and promotes cell differentiation (30,177⇓). Activation of PPAR-γ has also been found to markedly block advanced glycosylation end products–induced mitogen-activated protein kinase activity (179) and high glucose–stimulated vascular endothelial cell growth factor expression (180), consistent with the inhibitory effect of PPAR-γ on cell proliferation of mesangial cells. Importantly, PPAR-γ activators can also suppress high glucose– and TGF-β–induced collagen I and fibronectin production in these cells (176,181⇓). Collectively, these data suggest that PPAR-γ may reverse the phenotypic change of mesangial cells, induce cell growth arrest, and decrease extracellular matrix accumulation in the diabetic condition. In addition to mesangial cells, PPAR-γ expression was found recently to be expressed in the proximal tubular cells (182,183⇓) and upregulated in the presence of high glucose (183). Activation of PPAR-γ induces the G1 phase of cell-cycle arrest, and suppresses high glucose–induced AP-1 activity and MCP-1 expression in the proximal tubular cell line HK2 cells (183). These findings suggest that PPAR-γ activators have potential antiproliferative and anti-inflammatory effects in renal proximal tubular cells and may be beneficial in slowing the development of diabetic tubulointerstitial fibrosis. In summary, PPAR-γ agonists can improve urine albumin excretion and slow the progression of glomerulosclerosis in animal models. These desirable renal effects make PPAR-γ a promising target for treating glomerular fibrotic diseases, especially diabetic nephropathy. We are faced with an epidemic of global proportions in type 2 diabetes. Diabetic nephropathy related to the increased incidence of type 2 diabetes has become a dominant health concern. The metabolic syndrome and associated insulin resistance are important contributors to the pathogenesis of both diabetes and its complications. In the last decade, numerous efforts have been directed toward understanding the underlying mechanisms and developing novel therapeutic agents targeting the metabolic syndrome. PPARs comprise a subfamily of nuclear receptor and transcription factors and have been proved to play a critical role in modulating insulin resistance, hypertension, dyslipidemia, obesity, hypertension, and inflammation. Given the close relationship between PPAR activity and the metabolic syndrome, PPAR agonists and antagonists are promising therapeutic agents for diseases including type 2 diabetes, obesity, hypertension, hyperlipidemia, and atherosclerosis. Fibrate PPAR-α agonists and TZD PPAR-γ agonists have already been used successfully as clinically effective hypolipidemic drugs and insulin sensitizers. PPAR-β/δ agonists may provide additional insulin and lipid modulators via effects on skeletal muscle. In addition, there is increasing evidence suggesting that all three PPAR isoforms contribute to the metabolic control of renal function and are involved in the pathogenesis of diabetic nephropathy. PPAR-α agonists and PPAR-γ agonists both may provide therapeutic options for nephropathy in type 2 diabetes. Because each PPAR isoform plays a distinct role in the pathogenesis of the metabolic syndrome, recent effort has been focused on developing newer agents either with more selective activity or possessing dual- or pan-PPAR activating properties. Such novel drugs hold great promise in the treatment of the metabolic syndrome and its renal complications. This work was supported by grants from that National Institute of Diabetes and Digestive and Kidney Diseases (DK-065074-01 to Youfei Guan [Y.G. ], DK-37097 to Matthew Breyer) and the American Heart Association (AHA160200B to Y.G.). I thank Dr. Matthew Breyer for helpful discussion and critical reading of this manuscript. I also thank many colleagues and collaborators for contributions to our research described in this review.